Tee's Blurbs: Beauty Finds: Benefit Gimme Brows! I have heard so much - good reviews and raves about Benefit Gimme Brows but decided to skip it and try it later. See, I'm usually a brow powder kind of girl and I was content with filling my brows in using my way. During my latest appointment at the Benefit Brow Bar, the lady filled in my brows using Gimme Brows and let me just say - WOOOOW! I am now a convert! The brush-on fiber gel adheres to hair and skin, creating brows where there were none. 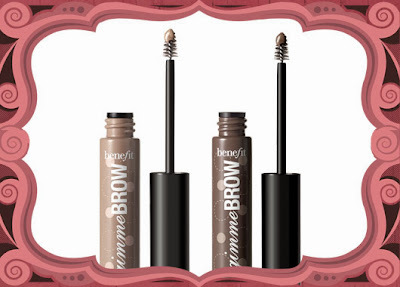 (From Benefit's website). For someone who was used to using powder, I thought it'd be a major adjustment. But surprisingly, it wasn't the case. I find using the product way easier, though I did adjust on using lighter strokes to build the product on my brows. The wand, designed for precise application, is just right for brow application. You won't have product where it shouldn't be. The outcome looks so natural, it's as if my brows were fuller and not sparse! I guess the formula also allows a natural look because it doesn't stick to the skin, not even underneath the brows. It doesn't have the drawn-on look that the pencil or powders usually come with. It's long-staying and it claims to be sweat-proof too. Though I prefer not to have any makeup on when doing my workout, this is a good thing especially being in a humid country. It's also buildable and one teensy coat can do so, soooo much. It comes in two colors and I find that the medium/deep brown color suits me well. The price may be a bit pricey for a small tube ($35 at Sephora for 0.10 oz), but I say it's all worth it. You only need a bit of product and the small tube might as well last you a long, long time. Do take note, though, that the recommended shelf life of the product once opened is 6 months. Benefit Cosmetics really knows makeup. I super love this product!